The SQN-4S has been the unrivalled Industry standard portable audio mixer since it was the first to arrive on the scene back in 1984. The new SERIES IV is the culmination of an extensive development programme to ensure that the SQN-4S remains at the forefront of location sound technology. Extending the control panel to include all the required functions on one face of the mixer has made it even easier to use than before. Newly designed tranformerless input amplifiers, larger output transformers for low distortion bass, virtually unbreakable analogue level meters, pre-fade listening, slating microphone, logic processing of many switching functions leading to a minimal length audio path, optional feed for four output channels and improved filtering and screening have all contributed to making it a welcome successor to its illustrious forbears. -130dBu (A weighted) from a 200 Ohm source. Isolation, channel to unrelated channel: 75dB at 1kHz, 60dB at 15kHz. The mixer is intended to work in several modes. The mode controls affect channel pairs CH1 & 2 and CH3 & 4. Within the pairs, channels 1 & 3 are called "first channels" and 2 & 4 "second channels". Twin MONO [O] in which the channels are unganged and each input channel can be routed or panpotted to either or both of the output channels. Mid-Side [MS] ganging in which the first channel fader controls the gain of both channels and the second channel fader acts as an image width control. Mid-Side Matrix [MAT] matrixing in which each channel pair has a mid-side matrix which will convert an MS input into AB stereo or vice-versa. Panning Mode [PAN]. The CH3, CH4 pair has a selectable panning mode in which the output is treated as MS encoded stereo and the channel signal is panned to move across the equivalent AB stereo image. The second channel of each pair can have its phase inverted by means of a front panel switch. This has the incidental effect of interchanging left and right in an MS encoded signal. Unbalanced inputs with a range of sensitivity from -20dBu to +20dBu for loudness parity with the internal monitoring. The sensitivity is adjusted by a screwdriver preset on the base. Two inputs directly into the summing amplifiers with their gain adjustable inside the mixer. Maximum sensitivity is 0dBu for +8dBu at the balanced outputs with the master gain set at 0. 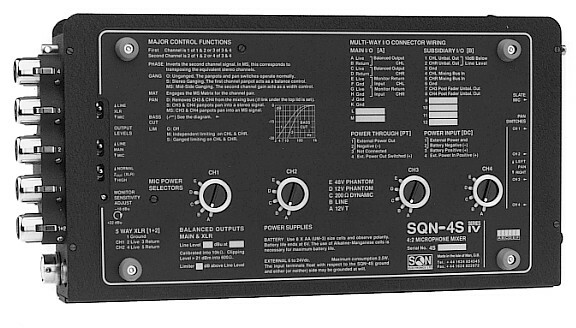 Two line driver amplifiers provide the output channels and each output is available on both an individual XLR and a combined 12-way connector. The level at either set of connectors can be attenuated by 50dB to provide a nominally microphone level feed. Floating sources (transformer coupled) with a clipping level of +20dBm into 600 Ohms. Distortion at the nominal peak level of +8dBm is less than 0.01% with a 600 Ohm load 20Hz to 20kHz. The output resistance is switchable from 60 Ohms to 180 Ohms. At 180 Ohms, with the limiter switched on, the mixer can be worked into an arbitrarily low impedance load with acceptable distortion. The balanced Mic-Level send is derived from a separate winding on the output transformer and has an essentially resistive source impedance of 200 Ohms. A subsidiary connector carries separately buffered outputs at 10dB below the level of the main line drivers. Buffered outputs at 10dB below the level of the main line drivers. Channels three and four may also be switched out of the mixing bus so that they can be recorded separately. Twin peak reading, logarithmic level meters with Peak Programme Meter (PPM) dynamics. Scaling may be BBC PPM, Nordic Norm, or SMPTE. VU meters can also be provided. The meters are normally calibrated with the mixer driving a bridging load of 10k Ohms. Meter illumination is by permanently lit glow tubes which consume no electrical power. The nominal line level is normally set at 0dBu for PPM metered mixers and +4dBu for VU metered mixers. Peak level, which is used as a reference for the limiters, is considered to be 8dB above this setting. Other calibration levels are readily available to order. Switchable [O]ff [M]ono [S]tereo (ganged). Approximately 40:1 compression over a 17dB range. Attack time constant 0.5ms, release time 100ms. The limiter threshold is set 1dB below the nominal peak level. An LED indicator for each output channel shows when the limiter is attenuating the signal. A tone at 1.05kHz which is injected into both channels upon operating a front panel switch. Two modes are available, [M]ono in which the tone is injected at a fixed level into both outputs and [S]tereo in which the left hand channel tone is interrupted for 250ms every 3s. The tone displaces the normal channel signal. Headphone amplifiers with adjustable gain capable of driving most headphone types to a suitable level. The use of headphones with a resistance of between 200 Ohms and 600 Ohms per side will make best use of battery power. The gain control is on the connector side panel. Please note that with some sets of headphones it will be possible to produce sound levels capable of damaging the hearing if the phones gain is set too high. Pre-Fade listening to each of the input channels is possible as is MS matrixing of the two output channels so that an MS recording may be monitored in the equivalent AB stereo. The monitoring mode rotary selector switch on the front panel [PHONES] has the following functions. A microphone mounted behind the front panel at the right hand end of the mixer is brought into operation by pressing a button on the side panel. The output of the microphone is levelled by a 2:1 compressor and overrides the main audio, appearing on the mixer outputs and in the monitoring system. While the microphone is active, the monitoring mode automatically reverts to the internal or [MXR] setting. Eight AA size cells housed in a quick-change compartment. The acceptable range of voltages is 6 to 24 Vdc allowing the use of most cell technologies. Battery life with alkaline cells will be 10 hours when using unpowered microphones. The right channel meter is fitted with a suppressed-zero scale, brought into operation by a front panel push button, which indicates the battery voltage directly. A supply in the range 6 to 24 Vdc may be used. The maximum consumption will be 2.5W and quiescent consumption, without microphones, 1.6W. The input terminals float with respect to ground. Either (or neither) side may be grounded at will, thereby allowing the use of floating supplies or grounded supplies of either polarity. There will be no possibility of hum-loops being formed. The mixer carries two four-way connectors, one of which [DC] gives access to the internal batteries for charging and also serves to connect to an external power source. The second connector [PT] is an output which provides a switched, short circuit proof connection to the power supplied to [DC]. This allows the mixer to be used as the focal point for a system of interconnected devices, all controlled from the mixer’s power switch. The mixer is designed to work over the temperature range of -20 to +60 �C. The outer case of the mixer is made of aluminium. The end blocks holding the connectors and the panpots are milled from solid aluminium bar. Inside the mixer is an inner compartment of steel, tin-plated after forming, which contains all of the circuitry that might be sensitive to radio frequency interference. The top and bottom of this compartment are sealed by copper screens and rf gasket material and all inputs to and outputs from this compartment are filtered. The circuitry is constructed on multi-layer printed circuit boards with internal ground and power planes which ensure the integrity of the internal grounding system.